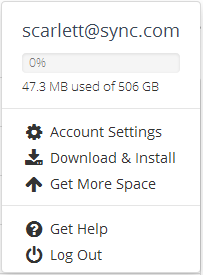 How do I get free space? Sync gives you free space simply by referring your friends! You’ll get an extra 1GB for every friend you refer (and your friend will get a extra 1GB too). 2. Click your Account Name at the top right corner of the screen. 4. Click on the Rewards tab. 5. Enter your friends referral code in the Manual redeem section. The referral code is the last part of the referral link. For instance, if a referral link is http://www.sync.com/?_sync_refer=e2a772 the referral code will be e2a772.